LONG READ: COMMENT & ANALYSIS: Westport is talked up as some type of exemplar for providing for cycling in Irish towns, but then, as the Irish Independent puts it, it’s also an example of how “getting commuters out of their cars and onto their bikes isn’t as simple as building cycle lanes” — can both of these be right? Westport Town Council and Mayo County Council officials should be commended for getting greenways in place in the town and in the wider county, but the concept and value of greenways are now well-proven, so it’s time to address the quality and details of the routes. Westport values its urban and rural greenways so much for tourism and leisure that there’s a large level of blindness to the major gaps and flaws in the infrastructure in terms of daily cycling which is attractive to most people. Even when the town’s cycling infrastructure is highly criticised in a consultant’s report, the authors still somehow come to the conclusion that the town’s routes reach a “Level B” quality of service standard. Based on that report, the Department of Transport Ex-Post Evaluation of Smarter Travel Areas then echoes the idea that there’s little or nothing wrong with the quality of infrastructure in Westport. The Westport Town Greenway is mainly a walking and cycling ring road-like route around the town but here are five core reasons why Westport falls short of promoting everyday cycling. If you want to radically increase the number of people cycling as a means of transport, you need an extensive high-quality network. Westport falls on this. Even putting aside the more subjective issue of quality (which we talk about below), Westport only has one long route with a link off it — that does not amount to an interconnected network. The Westport Town Greenway (shown in a dark green line on the map below) has few segregated or cycling-friendly traffic calmed connections into the town centre, none across the town centre, few to outlining areas and fewer again to nearby villages and clusters of rural or semi-rural housing. The Westport Town Greenway is made up mainly of old railways — to Westport’s quays and the start of the Great Western Greenway route to Newport and onwards. 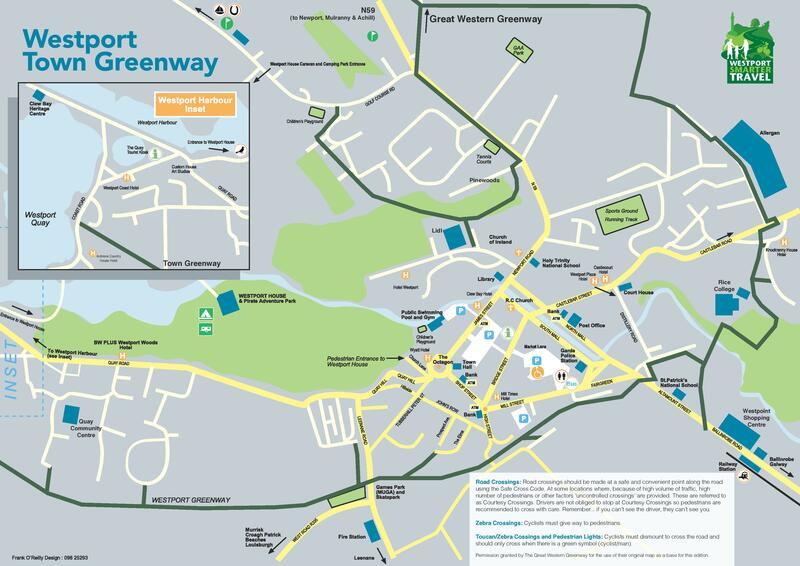 What the map does not reveal is that the town centre street network is defined by two-lane, one-way streets with heavy traffic; and there is nearly no cycling infrastructure of any kind within the greenway ring. The town can be very busy with tourism and it is a market town too. There’s also no segregated cycling or low-traffic connections to many areas on the outskirts of the town. For example, to the railway station, the housing on the Ballinrobe Road and Westport Industrial Estate on the Newport Road. But what the report says clearly isn’t the case. The network is far from complete and is flawed (see below). Nearly all of the infrastructure in Westport includes mixing walking and cycling on shared surfaces. The image at the start of this article shows the typical red and green surface colouring which can be found at junctions and at other conflict points such as sharp gradients. Some people think the two colours mark segregation between walking and cycling — but that’s impractical and unrealistic given the widths and it has no legal backing. Mixing walking and cycling on greenways can be fine outside urban areas where you would not expect high volumes of people walking and cycling. Mixing the two transport modes inside and around urban areas increases conflicts and kills any competitiveness cycling has — not so important for leisure but highly important if you want to attract people out of their cars. Mixing is made more unsuitable due to the often confined widths, blind turns, and the crazy gradients on some sections — and sometimes all three mixed together. Most elected councillors in high-cycling areas of Dublin, and in towns and cities around the world know this is an issue, and it will become a larger and larger problem for towns like Westport if they are successful in continuing to increase the numbers of people cycling. There’s very little that can be done to increase the width of the greenway and links at railway bridges in the short term, but in other areas there’s loads of potential to eat a small bit into green areas, widen ramps, and, where needed, compulsory purchase orders of space from private land. This references the Quality of Service Evaluation in the National Cycle Manual — but the manual is referring to cycle lane or paths, not shared paths or urban greenways. According to the manual’s width calculator, if there are walls or fences on both side of a cycle route (as there often are with the greenway) than 3.05 metres is needed just for a “basic two-way” cycle path. This does not include pedestrians, or people walking dogs etc. The manual also recommends extra width for hills and for sharp bends and for larger tourist bikes — that alone would mean much of the greenway would have to be over 3.5 metres just to accommodate cyclists. The consultants also conveniently did not seem to count cyclist/cyclist and cyclist/pedestrians interactions under the number of conflicts measure in the evaluation system. Westport is a hilly place, there’s no getting away from this. There’s little question that it’s the hilliest of the three larger towns in County Mayo. In regards to gradients, nobody is saying you can level hills, but connection ramps can be made longer and less steep, main greenway path can often avoid hills, and embankments and cutting can be formed where’s needed. Some people claim that Ireland can’t learn much from the Netherlands because that country is so flat, but that’s misunderstanding the make up of Dutch cycle routes which often go over or under large roads, motorways, wide shipping canals and railways, but they use gentle gradients to make such connections cycling friendly. 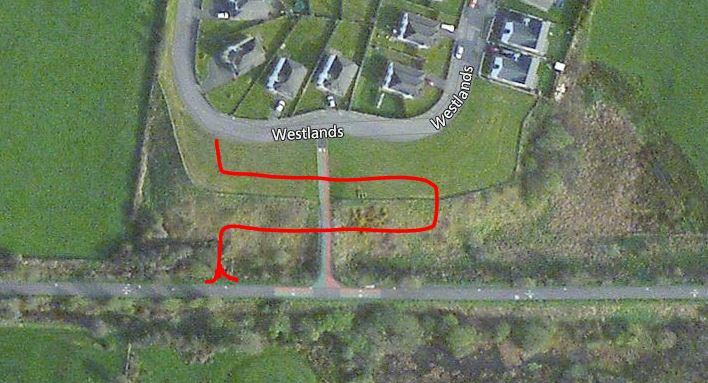 Here’s an example in Westport of where a house (circled in blue in the image below) was built on the old railway alignment and the chosen detour route (shown in yellow) goes up what we referred to as a crazy gradient for an urban cycle route. The only problem is it would have likely required compulsory purchase orders (CPOs) of land and, probably, more funding. Our above example is just one of many. In the Cycling Infrastructure Audit of Westport (mentioned above), the word ‘steep’ is mentioned 64 times and ‘very steep’ is mentioned 12 times. Sadly these audits are all too often focused on cheap fixes. So the audit team said it would “welcome any measures to reduce this risk and has proposed a number of potential options in this report including providing hand rails, guard-rails, and fencing on or at the bottom of steep ramps”. While there are some links to the greenway which may never be suitable for cycling and, in some cases, cycling should be blocked on these, there are better solutions than many of the current designs. The consultants were highly overzealous in recommending guardrails rather than recommending that ramp and general path gradients and other details be fixed. A common issue is connections from housing estates and apartments to the greenway, like this one to the Westlands housing estate. It may not be clear from the first look at the satellite image but the houses and the greenway on the old railway alignment are both at distinctly different levels. Instead of doing something like following the red line (which we’ve roughly drawn), the council just tarred over the previous walking connection — hardly suitable for everyday cycling for all ages. The Ex-Post Evaluation of Smarter Travel Areas highlights image issues, including the perception of cycling as purely a leisure activity as opposed to a mode of transport; the link between car use and socio-economic status; and the perception that cycling requires special gear. Is that surprising given, for example, the many extreme gradients on the Westport greenway unsuitable for commuting everyday, commuting for most people and the big push politically seems to be largely tourism focused? The above quoted section of the report does not mention high-vis vests by name but these are also commonly promoted across Ireland. The fact is that no town, city or country seems to have managed to focus on promoting high-vis and helmets as much as Westport and Ireland does and also foster mass everyday cycling. Low, single percentages of people use such gear in the Netherlands (usually tourists and other foreigners), and heavy promotion of helmets in Denmark was linked by some observers to a few years of stagnation in cycling’s growth in Copenhagen. A greenway is exactly the last place you should require high-vis anyway – the expectation is that it is full of cyclists. Car manufacturers spend millions on promoting cars as luxury lifestyle items. If we really want people to at least sometimes leave their cars at home, maybe it’s advisable not to promote often unnecessary cycling gear? We should start promoting cycling, and leave gear up to individual choice. Westport: The cycling town of Ireland? Westport, with its more than average hilliness, was an unlikely candidate to be a cycling demonstration town to start with, but it has been a surprising (even if limited) success in commuting terms. In terms of tourist and leisure cycling it has excelled. 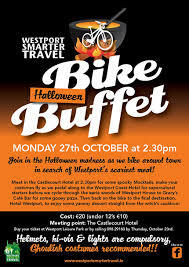 If Westport wants to get more people of all ages and abilities to cycle regularly it needs to up its game. Westport and Co Mayo generally will be up against strong competition for cycling tourism from the Waterford Greenway which is due to open officially in August and appears to be of a very high quality. In the coming years, there will also be competition from other routes too. Westport and Mayo County Council needs to build on the successes to date — it will need more funding and for people to look beyond short-term politics to make some difficult decisions around the use of space in the town centre and, if needed, the use of CPOs for improved urban greenway connections. I don’t agree that the concept and value of greenways is well-proven. The value of high quality greenways is proven but the European Greenways Association is made up largely of countries which are spectacularly unsuccessful in promoting mass cycling but with hype and spin are successful in generating ‘noise’ about cycling. Their standards appear to be based on the lowest common denominator so it is no accident that neither Netherlands nor Denmark are members. The use of the level of service for cycle facilities (from the National Cycle Manual) and its application to shared (greenway) facilities is dishonest. The National Cycle Manual gives a 3m width as the minimum for a one way cycle track shared with pedestrians. It does not give any minimum for two way cycling with pedestrians. A 4m wide facility for two way cycling (without pedestrians) is standard for ‘superhighways’ in the Netherlands, in Germany and in Denmark and it should be the Irish standard if we hope to attract oversea cyclists. On this basis, a 3m wide greenway would qualify as a ‘D’ level of service, the lowest, rather than a ‘B’ level of service. Hopefully, the success of the Waterford Greenway which is superior in width and surfacing will lead to rise in standards. As for Westport being a cycling hub, the 2011 census showed that the level of cycling for Westport was no different from any other small Irish town. The recent report from the Department of Transport found that there was only a very modest increase in the level of cycling as a result of being a Smarter Travel town so a comparison with the 2016 Census results will be interesting. Finally a wall should be 0.65m from a cycle facility so as not to affect users. If there are walls on either side an extra 1.3m would be required. Good article, having done the Greenway myself I was nodding my head at every point raised. One other thing that I found crazy for a supposed cycling holiday destination is how few bike spaces there are available on the trains to Westport. We could only book one space online and when we arrived at the station found that 8 other people were looking to get bikes into the 3 (yes 3!) available bike slots. We eventually had to disassemble one of our bikes in order to be allowed travel. If Westport wants to attract more of these cycling tourists it really needs to get Irish Rail providing more bicycle capacity on the trains. Last year a study in Berlin/Brandenburg was carried out where employees were given electric bikes for eight weeks and interviewed before, during and after the test phase on how that (in connection with the provision of a new “pedelec corridor” route designed for e-commuting) affected their transport choices. Westport would be a natural choice for a similar pilot as it’s a seriously hilly cycling demonstration town, but it sounds like it would be dangerous bordering on unethical to launch one under current conditions. People planning the gradients on cycle routes really need to get their heads around the fact that they have to be manageable uphill and safe downhill even for people who are frail and/or users of wheelchairs or mobility scooters or particularly hefty bikes (ordinary electric bikes, cargo bikes, regular bikes with small children in a trailer, the various special bikes used by people who are frail or impaired in their mobility – tricycles, quadricycles, hand cycles. It’s a traffic safety issue, but it’s also an equality issue – it’s not acceptable to scrimp and save on creating routes if accessibility suffers as a result. And ultimately it’s a false economy anyway, since excellent cycle routes are still cheaper than providing for other modes. Is there any town in Ireland with the perfect cycle facilities that you strive for. if we all thought this way nothing would be built. Its difficult enough to get CPOs through for roads never mind cycle ways. In my view there is a balance to be struck between traffic and cyclists. Surely in town centres with lower speed traffic and cyclists can co exist. yes Westport gradients are steep and still require some works. Were there restrictions on land available when they were built. In an ideal world the routes would all be flat but is that realistic and possible. Fairplay to Westport for achieving all they have done so far. Castlebar has done well with lough lannagh but you still share the roads with traffic in town. If only other mayo towns had the same amenities. I was planning to do the Bike Buffet before the Westportif this year so I had a look to see if helmets and high-viz are really compulsory. The poster for that event strongly implies that they are but doesn’t use the work “compulsory” or “required”. 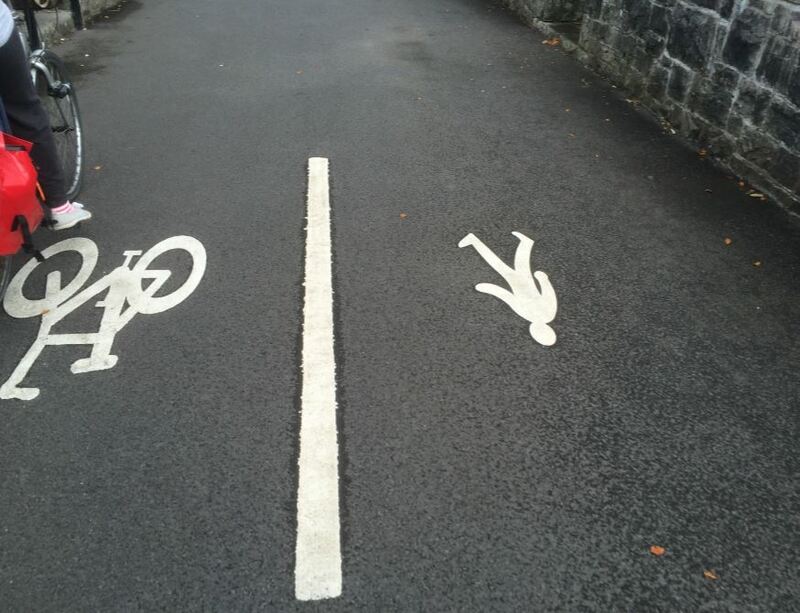 The photographs on their web site are a pretty sad indictment of the dangerisation of cycling. I’d be tempted to go anyway prepared to kick up a fuss but actually the sea of high-viz is kind of off putting even if I wasn’t forced to wear it myself. There’s no such thing as perfect cycle facilities. If we all thought what way? That we should strive for safe, well-designed cycling infrastructure which is attractive to use on a daily bases — is that really too much to ask for? Fair enough that’s your view. But national policy aims to make cycling attractive to a large proportion of the population, not just those brave enough to mix it up with heavy traffic as is common in the centre of Westport. We don’t live in an ideal world, but there’s a middle ground between the “ideal world” and some of the very poor designs used in Westport. Indeed, as we’ve said: “Westport Town Council and Mayo County Council officials should be commended…” “In terms of tourist and leisure cycling it has excelled” and “Westport and Mayo County Council needs to build on the successes to date”. Westport’s motorised traffic problems that are impinging on a comfortable and safe space for cycling are exacerbated by promotion of the Wild Atlantic Way route as a car- and coach-centric experience! Based on the photos available…. The red/green surfacing is an eyesore – it’s not very sympathetic to the environment. Doesn’t Westport have a town architect….? Adverse geometry of the cycle track can and should be dealt with by designing the route alignment as if it were a road – there are national standards out there for designing cycle tracks like there are for roads, so there are no excuses. If steep gradients are unavoidable by topography and alternative routes are not possible then extra path width must be provided to allow for “wobble space” on the up and maneuvering space on the down. Not sure if this has been done. The pleasure of using a greenway in urban/suburban areas for peds & cyclists is diminished by the use of a shared pavement and especially in this case where we can see narrow pavement widths. It is clear that the designers have attempted to address this by coloured surfacing but at the end of the day this is not much better than the ubiquitous “white line down the middle” and cycle/ped symbol markings. Splitting the cycle and footpath pavements where space allows, could have been used to reinforce the separate functions of the pavement and raise quality of service. The national affliction in blinkering out dutch practice and providing half-baked cycle infrastructure continues.